Addressing world leaders at the UN General Assembly in New York, he also charged that the US, Britain and France had blocked the naming of the real perpetrators of chemical weapon attacks in Syria. He said terrorists fighting the government in the civil war are being supplied with chemical weapons, but he did not name specific nations accused of supplying them. US President Barack Obama told the UN last week that it was Syrian President Bashar Assad’s army that was behind a chemical weapons attack in August that killed hundreds in the Damascus suburbs and brought threats of a US strike. Syria has committed to getting rid of its stockpiles of chemical weapons and the UN Security Council voted unanimously on Friday to oblige it to do so based on a plan made by the Organisation for the Prohibition of Chemical Weapons. Al-Muallem said it is clear to all that offshoots of al-Qaeda – “the most dangerous terrorist organization in the world” – is fighting in Syria. But some countries refuse to recognize it, he said. “The scenes of murder, manslaughter and eating human hearts were shown on TV screens, but did not touch blind consciences,” al-Moallem said. A video published online in May purported to show a member of Syria’s armed opposition eating a human heart while the body of a Syrian soldier lay close by. Another video the minister referred to purportedly showed rebels grilling the head of a Syrian soldier. The video with the heart drew condemnation from human rights groups as well as the Syrian National Council, one of the main opposition groups. 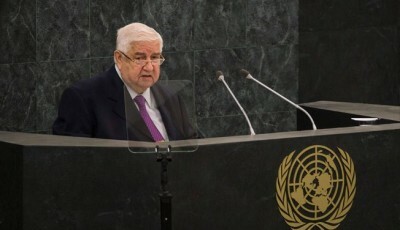 Al-Muallem said his government was committed to a political solution to his country’s conflict which he called a war against “terror” and not a civil war as the international community has been calling it for months. Syrian leaders have averted a US-led invasion to the state by agreeing to a call to put its chemical weapons under international watchdog. The move was applauded by the international community and the five permanent members of the United Nations Security Council unanimously issued a resolution on Syria’s chemical weapons.